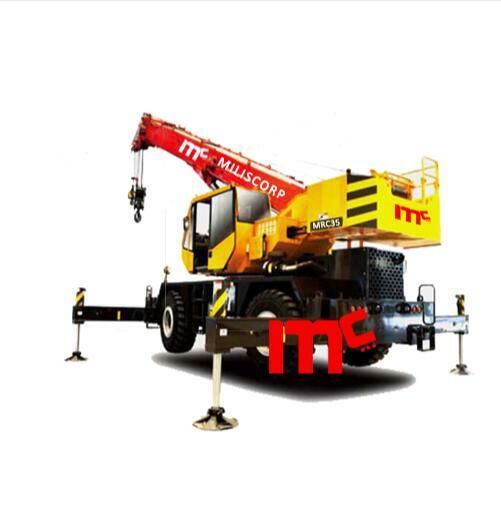 we provide xcmg, sany ,zoomlion all terrain cranes. Using PROE, finite element analysis, simulation and simulation analysis and other high-tech software optimization design, the maximum use of material mechanical properties, light weight and higher mobility. The main boom is 31.5M long, the industry is leading, the rated load is 35T, the overload is lifted, the installation angle of the jib is 0 degrees, 15 degrees, and 30 degrees, which can provide a variety of operation modes. The four wheel drive has good dynamic performance, maximum driving speed of 37km/h, maximum climbing grade of 75%, full hydraulic power steering, 4 kinds of steering mode, good maneuverability, and the minimum turning radius of four wheel steering is not more than 6.2m, and the passing property and comfort of complex road conditions are improved. Hydraulic system load feedback, constant power control, lifting capacity, micro mobility, unique slewing buffer design, braking more stable. The independent research and development of the special controller SYMC of engineering machinery, using all digital network control technology of CAN bus to control the stability of the signal, the simple wiring harness, high reliability, the torque limiter with the omni-directional intelligent protection system, the precision is within 10%, the comprehensive logic and interlocking control, the operation more safe and reliable. Looking for ideal Sany All Terrain Crane Manufacturer & supplier ? We have a wide selection at great prices to help you get creative. All the Zoomlion All Terrain Crane are quality guaranteed. We are China Origin Factory of China Rough Terrain Crane. If you have any question, please feel free to contact us.